The tape-sine method uses a combination of distances measured by a tape and the sine trigonometric function. This method is not limited to 90° and can also be used to lay out an angle or measure the angle between two existing lines. A review of the three commonly used trigonometric functions will make this method clear. The same relationships are true for angle C. Each of these functions forms an equation with three variables—the function of the angle and the lengths of two sides. If any two of the variables are known, the third can be determined. In the tape-sine method, only the sine function is used. The procedure for laying out an angle (0) is slightly different from the procedure for measuring an existing angle. FIGURE 13.5. Example of tape-sine method. next step is to measure the distance BC. The last step is to form two right triangles by drawing a line from corner A to the mid point of line BC. 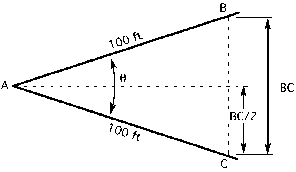 The distances BC/2 and AC are two sides of a right triangle. 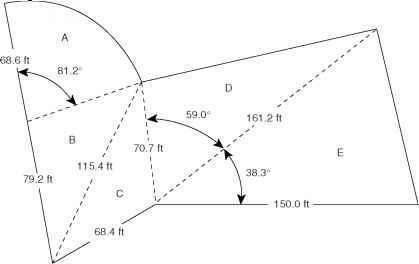 For this example we will assume that the distance BC = 61.8 ft. 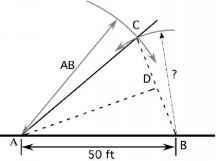 The angle for either triangle can be found by using the Sine equation. The value 0.309 is the sine ratio of angle A. The next step is to determine the angle having a sine ratio of 0.309. To determine the angle using a calculator, enter 0.309 and the inverse of the sine function. The angle can also be determined by consulting Table 13.1. FIGURE 13.6. Laying out an angle by the tape-sine method. Either source should give an angle of 18°. Because we used the distance BC/2 to solve for the angle, the angle CAB is actually 18° x 2, or 36°. The same procedures can be used to lay out an angle. For example, suppose you need to establish a fence at 40° to an existing fence. How would the tape-sine method be used? Study Figure 13.6. The principles involved are basic trigonometry. It takes two points to establish a line and to locate a point either three dimensions or an angle and one dimension must be known. To establish the line AC so that it forms a 40° angle with the base line AB, three dimensions are used to locate point C. Two of the dimensions are the distance selected by the person laying out the angle. In this example 50 ft is used. The third dimension is the distance from point B to point C. To determine this dimension mentally split the triangle CAB into two right triangles (BAD and CAD), solve for the length of the opposite side of either, and then double this distance. The doubled distance is distance from B to C. The distance A to C is the same as A to B. Using point B and the length BS scribe a short arc in the vicinity of point C. Using point A and the length AB scribe another arc. The intersection of the two arcs is point C. A line from point A through C will establish the fence at the correct angle. the two arcs (point C). A line drawn from point A through point C will establish a line at a 40° angle to the base line (AB). In this method, the marking of two arcs could also be eliminated by using two tape measures.